We have a visitor this weekend! I have been making more crumb blocks in spare moments...I will sew a line or two or three in the odd moments o the day. If I am cooking, I will sew a few lines, then go stir or turn or do whatever needs to be done. Then sometimes I actually get to sit and hour or two. I have made 14 of these 9½ inch blocks over the past few days. I have 3o more down in the basement. I don't want to make a quilt of them till I have time to actually quilt it. Daughter ordered fabric for the backing of the Lotus quilt and I ordered batting....just today. She took a bit of time to choose the backing. A friend of mine asked me how many quilts I am working on...and I am not quite sure how to answer. I have enough of these crumb blocks for a quilt top I think--at least for a twin quilt. And I have enough of the Falling Charms for a twin quilt, also. But mostly I am just waiting on everything to get here to finish the Lotus quilt. That is the sweetest looking child! Just makes you want to hug her. I love those quilt squares. Now that's the kind of quilt I want to make. Thanks for sharing the lovely pictures! Beautiful girl and lots of fun blocks. I find it so soothing to make log cabin blocks out of scraps. Wow! only three quilts in process, that's pretty good. I really need to make some crumb blocks...I have a grocery bag full of pieces and parts. Your Matey thar is darn cute! A precious photo of Lorelei and Rosie. I love your quilt squares. Wishing you a nice Saturday! Cute outfit Lorelei is wearing. I have some of the same fabrics in your crumb squares. Small 'fabric shopping' world! L is the cutest pirate i have ever ever seen. adorable... and i love the colors for this quilt and it is a great thing that you love to quilt. you will never be bored. This is the cutest pirate I've ever seen! Just adorable. The quilt blocks are so colorful and will make a pretty quilt. Have a nice weekend! 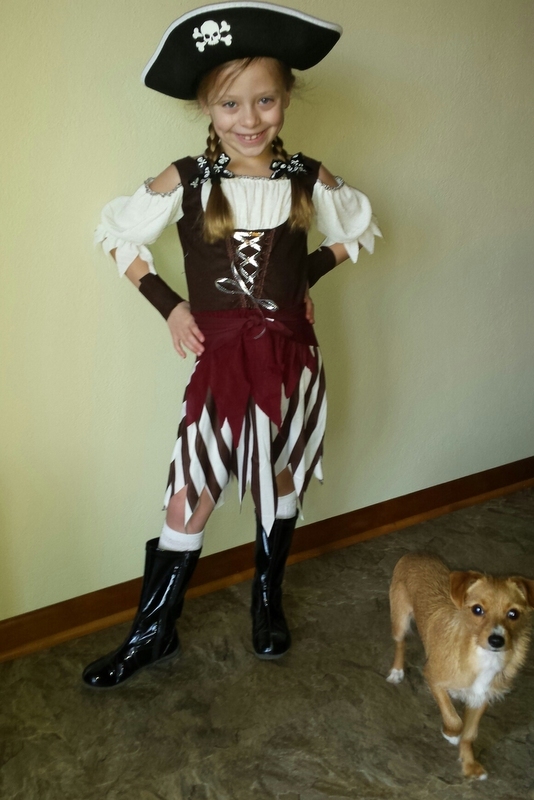 Lorelei is the cutest pirate I have ever seen! Lorelei looks beautiful in her pirate costume. What a lovely guest to distract you from your quilting. And those quilt squares look beautiful. The finished quilt will be stunning when you get it done. With such major projects I can totally understand how you'd have several of them on the go at any one time. Your visitor is adorable.. and that quilt is gorgeous. Rose, I forgot to tell you earlier that my daughter does have a blog. It is Sidetracked Lynn on blogspot. She is in my blog list. Thank you for asking.